Tomorrow the awards season officially kicks off with the 70th Annual Golden Globe Awards. Both movie and television stars come together for one night of fun, fashion, frivolity and fierce competition to decide who wins, who loses and give us a hint of what to expect at the Academy Awards next month. And for the first time ever, the show will be co-hosted by our favorite female SNL weekend update alum. The Hostesses with the Most: Tina Fey and Amy Poehler will certainly be on cloud nine tomorrow night. According to all reports, they have promised a night of fun, frivolity and a certain amount of cynicism. Both beautiful and equally smart, these two pose a double threat (squared). One of my Red Carpet favorites is Emily Blunt. 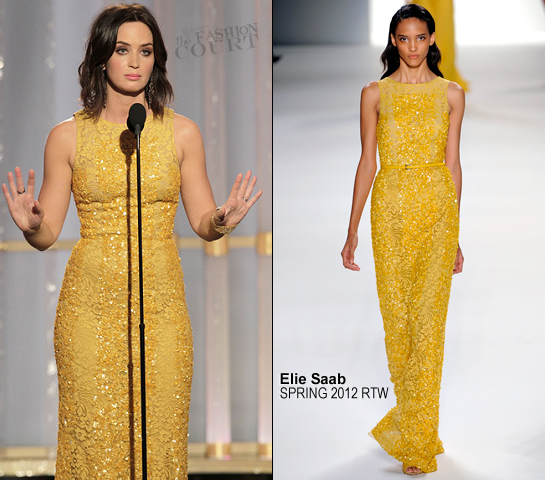 Last year, as a presenter, she wore this golden, shimmering, Elie Saab Couture gown. This year as a nominee for Salmon Fishing In The Yemen, she will definitely bring her “A” game … although I don’t know how it could get much better than this! There are many red carpet looks of Jennifer Lawrence – nominated for her role in Silver Linings Playbook. You only need to remember this one from the 2011 Academy Awards, and that’s when hardly anybody even knew who she was. Nicole Kidman, nominated for her role in The Paperboy and for Hemmingway & Gellhorn, has a slew of jaw-dropping red carpet moments but, this pale pink Chanel from 2002 is my favorite!!! It is soft, dainty, feminine and timeless. Since she is a double-nominee, expect her to pull out all the stops! Meryl Streep, nominated for her role in Hope Springs, also has a slew of red carpet moments but, unfortunately for Ms. Streep, jaw- dropping isn’t always a good thing. Where is the stylist from The Devil Wears Prada when you need her? Meryl Streep is one of the most beautiful & talented actresses in the world. What gives? 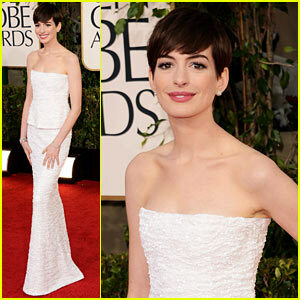 Michelle Dockery of Downton Abbey has really honed her red carpet style since last year’s Golden Globe disaster. Compare this Ralph Lauren gown at the Met Gala later in the year. Julianne Moore gave an incredible performance as the former governor of Alaska in Game Change. Definitely my pick for best actress in a television movie! Although she doesn’t have the best track record on the red carpet, there is hope. Maybe she picked a stylist who will give her a little better shoe advice than she had in 2012. This gown is terrific – the shoe is a drag. Whoever wins or loses, there is always a lot to see on the red carpet before, during, and after the show. 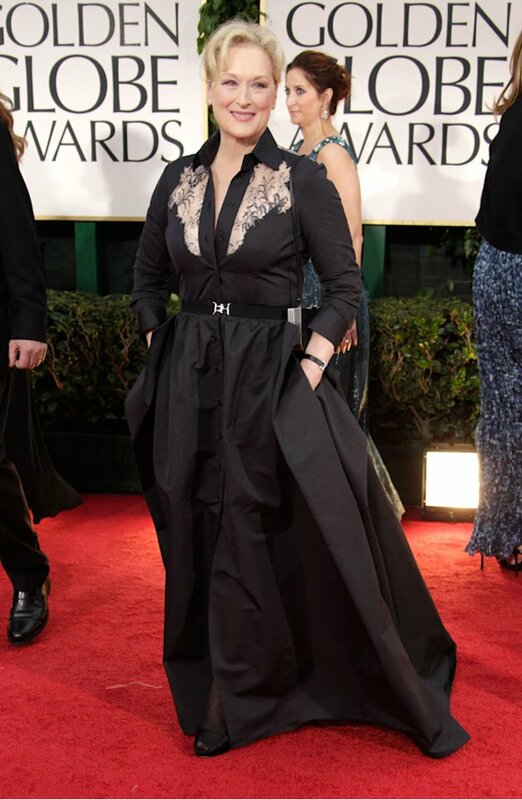 Check back Monday for our Best & Worst picks from the 2013 Golden Globes Red Carpet! One of the most effective things you can do to transform a standard room into a stunning masterpiece is to incorporate ‘Creative Illumination’. Creative Illumination, also known as the right lighting, will create a look that can be achieved no other way. You can turn any venue into a showplace with the right lighting, photographs will look better with the right lighting and forget photo-shop, you can take 10 years off of almost anyone’s age with the right lighting! 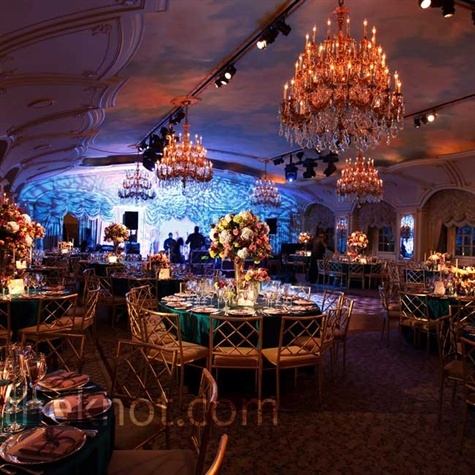 The best part is that it can all be changed to completely alter the mood; cranked up for some serious dancing at the reception, diffused and toned down to enhance the romantic first dance. 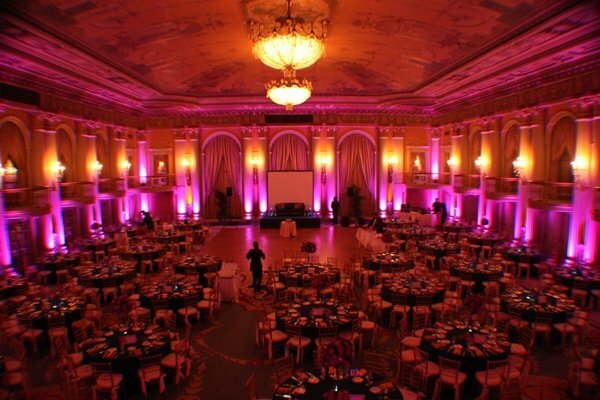 According to internationally acclaimed event designer, Preston Bailey, “You need to take advantage of the effect color can have on the atmosphere by changing the shades through the course of the night. For example, if your cocktail hour starts around sunset, you can splash your room with golden tones. During dinner, consider soft lighting that will mimic flickering candlelight. As the party progresses, I would change the lighting to something a little bit more exciting. Making this transition is simple, with intelligent lighting (which can be programmed to coordinate the whole lighting setup). With the push of a button, you can change the mood of the room,” Bailey says. Make sure your lighting specialist has credentials. Ask to see photos, videos, ask for references and recommendations. Meet with your lighting designer at the venue so you can go over every single detail in person and make sure someone from the venue also attends the meeting so they can answer questions about power usage, wattage, voltage and backup plans. 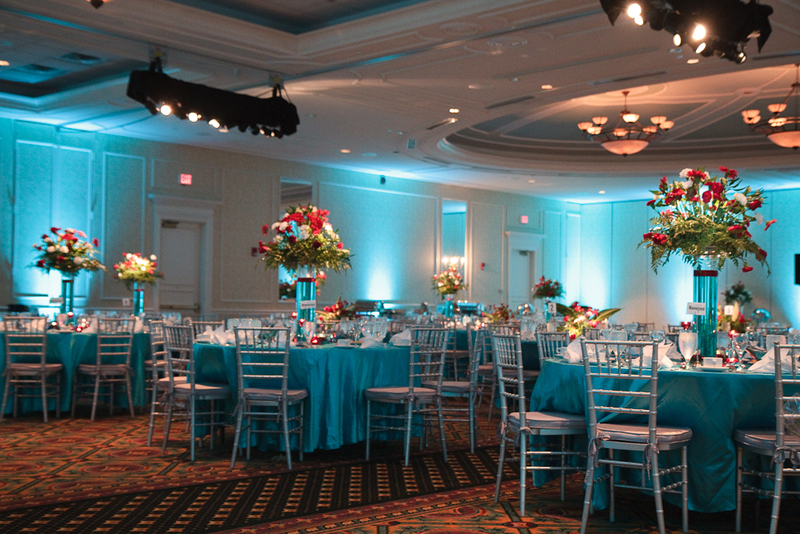 If you decide on this type of lighting, it will play a major role in the event, as much as the flowers and centerpieces. As a result, you should be on top of every detail and not leave anything to the imagination. Don’t forget accent lighting as well, this is especially true for outdoor weddings. Chinese lanterns, colored bulbs and multiple strands of twinkle lights can add a touch of elegance, whimsy or sophistication depending upon the lights used and the desired effect. Again, always ask for pictures. Creative Illumination will define the mood for the entire event, it will make or break your photos. Most of all, it can turn your already beautiful wedding into and unforgettable paragon of style and beauty! With twinkling lights, jingling bells and chestnuts roasting on open fires, it’s no wonder December reigns as the most popular month to pop the question. Thirteen percent of marriage proposals happen in December, while February, despite Valentine’s Day, accounts for just 8 percent, according to the Conde Nast American Wedding Study. Holiday proposals can be among the most romantic because there are so many creative ways to pop the question. Whether it is Christmas or New Year’s Eve or another celebration, these are my top five favorite Holiday Proposals. 1) Spell out “Will you Marry me?” with Christmas lights. There are actually companies that will orchestrate the whole thing for you including setting up the lights or you can spend an afternoon (like Clark Griswold) toying with lights and extension cords – it’s up to you. 2) Wrap the ring box inside a large box and then successively smaller boxes so that your sweetheart will initially think the gift is quite large. Nesting boxes are great for this and often come in sets. As each layer is opened, the laughs will grow. Get down on one knee right as the last box is opened. 3) Decorating the Christmas tree together, you hand her an ornament which has the ring tied to the top of it. Make sure she is not standing on anything or she might fall off! 4) Organize a scavenger hunt. Start off with a simple clue to someplace nearby, then get more complicated as the scavenger hunt progresses, and have the final location be a place where you can hide and then pop out and get down on one knee. 5) Buy a scrabble game, spell out the words “Will you marry me” and glue the tiles onto the game board. When she opens the gift, make sure she opens the whole thing so she can see the tiles, and then present her with the real gift – the ring! Whatever method you choose, this is a spectacular time to get engaged, since the holidays are all about family and celebrating with the people you love the most. Giving Away The Bride – Who’s In, Who’s Out? It is a well known fact that it is the responsibility (and honor) of the bride’s father to walk the bride down the aisle, presenting her at the altar to her future husband, and then later sharing a dance. 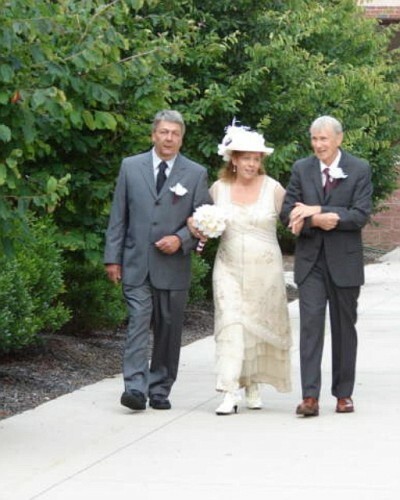 In some cases, both parents walk the bride down the aisle and in other cases she walks alone and rare cases where two grown men come together and share this responsibility equally, and of course cases where the mother walks the bride solo. In 2012 you have all sorts of combinations and none of them is right or wrong. This is one of those ever-changing customs that seems to get more complicated every day. Who is paying for the wedding? If your stepfather is paying for the wedding 100%, he should be given the place of honor at your side, right? Maybe. That is unless, of course, he had absolutely no hand in raising you, barely knows you, recently married your mother and you never lived under the same roof with you, he is not exactly a parental figure – yet. Who raised you? If your father raised you, cared for you, packed your school lunches and drove carpool to dance class, he should be given the place of honor at your side even if he doesn’t have one dime to contribute toward your dream wedding, right? Maybe. Blood is thicker than water and family is more important than money. However, your stepfather ( and mother) may have some trouble swallowing the idea of paying for everything and receiving no end credit. Is there even a father figure in your life? If your father is deceased or absent from your life and your mother raised you single-handedly, she has every right to be at your side… just the two of you. If she declines (and she might) , ask a favorite uncle or a brother. Does everyone get along? If so, have this conversation in a group and include his family as well. Keeping the lines of communication open will make planning much easier. For instance; your parents are divorced and both remarried. If everyone gets along swimmingly and you want to have an honest discussion about who is paying for what and who has what role in the wedding this – do it. It will save tons of time and drama later. Even if you are all on great terms this might be a touchy subject and hurt feelings could turn into a huge family debacle if left unchecked. Always be respectful of the role your parents have played in your life up to this point – it is not all about the wedding. The point is to be inclusive and not exclusive. Can anyone even be in the same room?If you have the unfortunate circumstance of having suffered through a bitter divorce, subsequent re-marriages of your parents to other people and extremely hostile family relations – buckle up…this is going to be a bumpy ride! Hold on tight to your fiance’s hand and get through this however you can. My advice is to delegate the dad responsibilities with whomever you feel is the most deserving and responsible and be prepared for the repercussions. Of course this is more complicated than a simple decision but go back to questions #1 and#2 and decide who played the most important role in your life. Do not let anyone hold you hostage by threatening to boycott the nuptials if they don’t get their way, this is your decision (as a couple) and there is no going back once the decision is made. It is important to make this decision early since the wording on the invitation can be complicated with fractured and blended families. If parents and stepparents are all assisting financially with the wedding, their names should be on the invitation. This is can be tricky so ask your invitation specialist to help you with the wording before you make a costly mistake. For the Father/Daughter dance you can dance with both dads during the course of the song, changing partners after an allotted time, you can dance with one father ‘figure’ or you can omit this routine entirely. No one says it has to be a part of your wedding. Discuss this with your DJ. 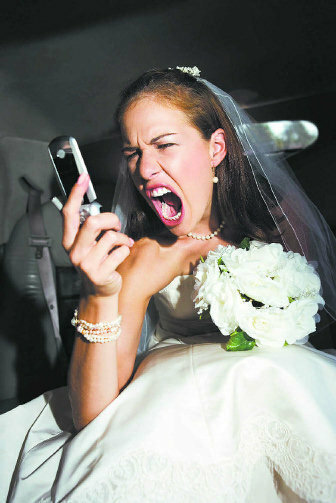 The absolute worst thing that can happen at your wedding is to let any of these small situations get out of control. Unless you are one of the rare families that get along famously and never argue, you will have some sort of struggle on your hands. Close your eyes, envision the outcome you desire and when you open your eyes take whatever steps necessary to make that happen without hurting anyone’s feelings or stepping on anyone’s toes. That means at no point in the conversation are you allowed to say “It’s my day” since that expression is a tad over-used and completely self-induglent. You have to be respectful and make your point without becoming a martyr or spoiled brat. Remember that if you have the luxury of having parents or multiple parents, count your blessings, even if they don’t love each other as much as you would like, they most certainly love you and will most likely do whatver it takes to ensure your wedding is a joyous occasion. I got a phone call today from a friend who is getting married in 2 weeks. She ordered her gown 9 months before the wedding date just as she was told , she gave a 1/2 deposit just as she was told, and now she sits less than 14 days before her wedding without a gown, worrying where it is and wondering why it took so long. Worrying if she is going to have a gown before her wedding, wondering if it is going to fit. Worrying if she should go somewhere else and buy a backup gown and wondering how she got into this mess in the first place. Earlier is better. Give yourself as much time as you can. 1 year? No problem! 18 months, even better!!! Start shopping for your gown as soon as you become engaged. Designers take a minimum of 6 months to complete an order and can take even longer depending upon the style, fabric and beading. Reputation is everything. Shop at a trusted salon, one that you have heard great things about. Go on the internet and do a little snooping around. Good recommendations are golden and word of mouth is the best referral. Decide which is more important; savings or service! Working with bridal professionals makes your journey a lot more enjoyable. Do your Research. Find out the designer of your gown, where their company is located, where the garments are made and what their standard shipping time is. Ask Questions. When you have a question, do not hesitate to ask your salon bridal consultant. They are familiar with the stock, the designers, the alterations, every aspect of the business. They get customers from referrals and they know that you will be their biggest advocate if you are happy with your service. Back Scratching. Take care of your consultant and your consultant will take care of you. I’m not saying to bribe your consultant. I’m saying a nice note and a kind word all go a very long way when it comes to service. Plan ahead. If you do not have a gown within 2 months of your wedding date, you will need to have a backup plan in place. 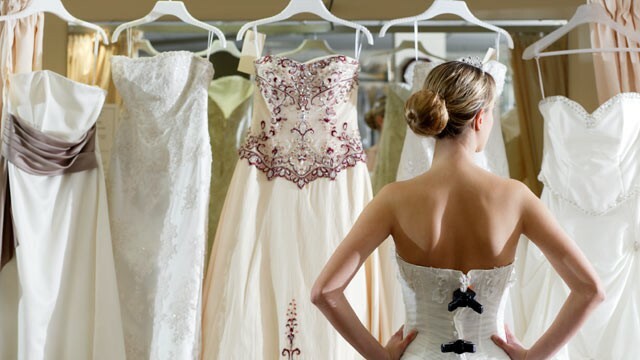 Remember that there are scores of salons that deal in consignment bridal gowns from major designers. Remember, the worst thing you can do weeks (days) before your wedding is to stress and worry. It will trigger all kinds of physical symptoms; weight gain or loss, bags under your eyes, breakouts, hair loss, mood swings and more. Most importantly, you are in control of the situation, the situation is not going to control you.